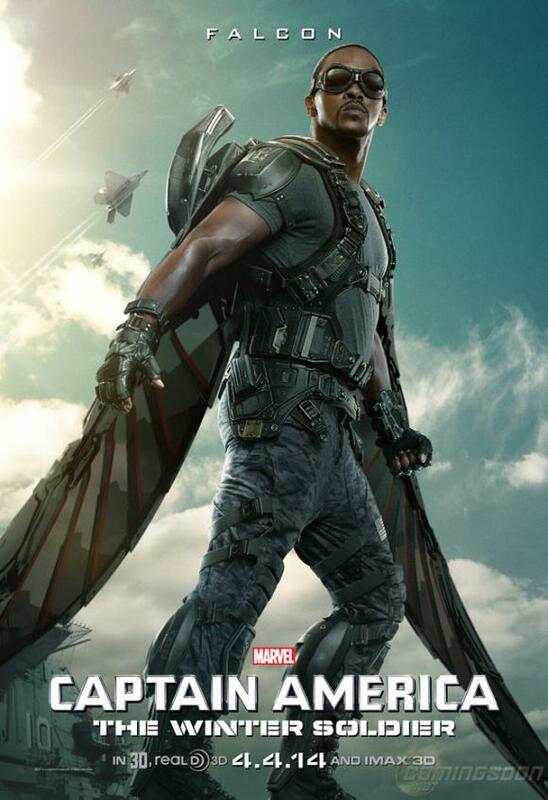 It’s taken a while, but we finally our first Captain America: Winter Soldier character poster showing Cap’s new pal Falcon in all his winged glory. We’ve been getting more and more peeks of Anthony Mackie’s Falcon from the trailers, but Marvel waited until now to finally unveil his own poster. As has been the theme for Marvel character shots, it’s pretty epic, and we’re more excited than ever to see this dude in action. Thankfully, its a lot cooler than his tiny cameo on that international design. The film is being billed as a “political thriller,” and with its tight focus on S.H.I.E.L.D., it will also serve as a stopgap semi-sequel to bridge the gap between Avengers and Age of Ultron. It’s also digging a lot deeper into Cap’s comic canon, with Winter Soldier and Falcon making a debut. Considering his varied history in the comics and rather unique abilities, Falcon is an admittedly tough sell to pull off with a grounded approach on the big screen. But the more we see from Mackie, the more we think this can actually work. Considering the fact that he'll apparently be sticking around for a few movies, that's a good thing.